I remember when I first listened to Desecravity’s Morphic Signs and was in awe back in 2014. They play a perfect blend of tech and brutal Death Metal. Morphic Signs is a continuous blasting without breathing. If you appreciate the heavy-metal-inspired solos added for maximizing the climax effect after a series of ear-pummeling riffs a la Vital Remains (because more is more…), then Morphic Signs is the perfect album for you. If you like it, then you will love Anathema, their latest album, which is is a display of neoclassical virtuosity all made fast as hell. They have successfully taken the sound to a new level. I remember that as a child I didn’t really have many metalhead friends and I had to learn by myself how to distinguish between Black and Death Metal. I was new in the metal world and wanted to categorize everything, but I was lazy too check the genre every time I listened to a song, so I came up with an easy distinction: Black Metal had more Thrash in it and Death Metal more Heavy. With the passage of years one learns that it is not that simple, but to think in that manner helped me a lot in the beginning, nonetheless. 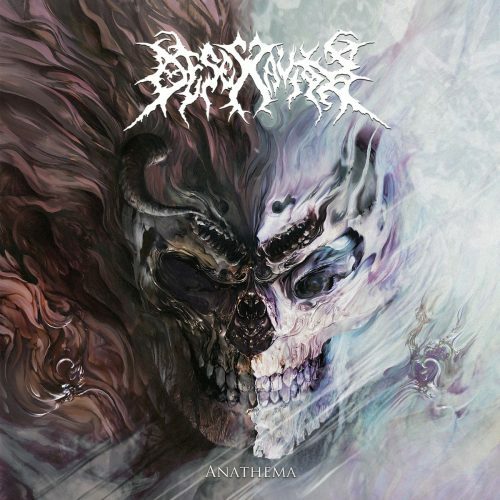 Desecravity’s new album reminds me of of that period when I tried to find heavy metal in pretty extreme stuff, so I could call it Death Metal. It also reminds me of what Bill Ward (Black Sabbath) said when picking his favorite 10 metal albums and referring to Krisiun’s Southern Storm: “They’re a great example of heavy metal, or what I consider to be heavy metal.” So yeah, for me Desecravity’s Anathema is another of the best examples of… let’s call it technical and advanced Heavy Metal. This beauty of a musical beast is framed in a context that sets you up for an epic heavy metal journey, but you get this mixed with high level technicality and of course the Death Metal B-movie inspired characteristic brutal sound. Anathema is intricate, and more complex than Morphic Signs, and the musical skills on display have gotten even better. By now I’m used to seeing how bands who step into a more complex musicianship challenge themselves with more progressive structures, and this is of course the path that Desecravity have taken as well. I find the progression to be pretty akin now to Canadian Death Metal masters Cryptopsy, and it also reminds me of Cephalic Carnage. There are other sound details on display, for example some blackened nuances in songs like “Impure Confrontation”. On top of all this you get exquisite virtuoso guitar work, and a good bass sound that can be compared to that of Cryptopsy. Together with the brilliant, relentless drumming, it add lots of density to the rather advanced and pretty progressive song structures. Anathema can’t be reduced to one thing. It is many things in one, and in the details, especially when it comes to the drumming. All those details are so interspersed and so subtle amidst the blasting that it becomes a pure delight and takes many many listens to appreciate the complexity of it. It seems the beautiful Yuichi Kudo’s beautiful drum kit has gotten some small new additions, contributing to the diversity of sounds (if you haven’t seen it just check their videos). Even though there is beauty to be found in the composition, this does not make the album less brutal. In addition, the band’s unique scaling, which has a distinctive Japanese sound, has become more prominent and it is now their trademark. I loved the whole album, but my personal highlights are the awesome drumming march found in “Secret Disloyalty” and the intricate details in “Bloodthirsty Brutes”. I hope that after reading this you will go and find your own highlights. Can you imagine a show w Hate Etenal and these guys? None’d be alive to tell posterity of the sheer brutality—as is dust.